Can you confirm these amateur observations of Mauremys sinensis? Introduced to Korea (Chang et al. 2012). Comment Hybridization: SCHILDE et al. (2004) reported a hybrid between Ocadia sinensis x Cyclemys shanensis. OTANI (1995) and FONG & CHEN (2010) reported hybrids between O. (Mauremys) sinensis x Mauremys reevesii. O. glyphistoma is a hybrid between Ocadia sinensis and Mauremys annamensis (DALTON 2003). A specimen of O. glyphistoma studied by SPINKS et al. (2004) was most similar morphologically to O. sinensis yet falls on a short branch in the clade with Mauremys by DNA sequence data, a result that is consistent with it being a hybrid between a male O. sinensis and a female M. annamensis. Similarly, STUART & PARHAM (2007) confirmed that O. glyphistoma is a hybrid of Mauremys sinensis and M. cf. annamensis. Distribution: has been found in Micronesia and may have been introduced there (Buden & Taboroši 2016). Savage, J.M. 1953. 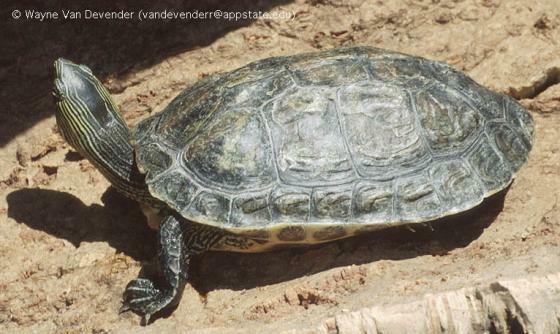 Remarks on the Indo-chinese turtle Annamemys merkleni; with special reference to the status of Cyclemys annamensis. Ann. Mag. nat. Hist. (12) 6: 468-472.